One of Zimbabwe’s top opposition politicians remained in police custody Thursday as his fellow deputy ministers were being sworn in to join the new unity government led by President Robert Mugabe. Deputy Agriculture Minister-designate Roy Bennett has been in prison on charges of terrorism, banditry and sabotage since last week . He was arrested as he tried to leave the country. The foundation of the new government — formed by Mugabe and the opposition Movement for Democratic Change (MDC) — has been unsettled by the arrest of Bennett, a longtime Mugabe foe and senior MDC member. Mugabe downplayed the situation, telling reporters after the swearing-in ceremony “it’s a court case.” “I do not know why (Bennett’s arrest is grabbing headlines) across the world, that is a court case,” the president said. Bennett’s lawyer was seen Thursday in Harare trying to apply for bail for his client at the High Court. A court hearing is expected within a week. Besides Bennett, more than 30 MDC supporters have been arrested since December and remain in prison, facing charges of plotting to topple Mugabe. MDC leader Morgan Tsvangirai, who is now the country’s new prime minister, told members of his party Wednesday he was concerned by the continued arrested of his supporters. 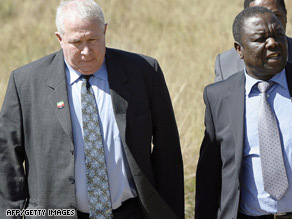 Zimbabwe’s new leaders are grappling with a massive humanitarian and economic crisis. Many civil servants — including teachers, doctors and nurses — have been on strike since September, demanding higher pay as Zimbabwe’s currency has plummeted in value. That has caused many schools to close and exacerbated a cholera epidemic that has killed nearly 4,000 people and infected about 65,000 people since August. The power-sharing deal signed last year by Mugabe’s Zanu-PF and the MDC for the unity government is seen by many as the only panacea to the crisis. The deal came after a hotly disputed election in which Mugabe claimed victory, but the results were questioned by opposition leaders and international observers. Many Zimbabweans are hoping that the coalition government can remain intact and halt the country’s economic meltdown. But Mugabe seemed to underline the divisions in the unity government.